Darn It...I Forgot My Bulbs! 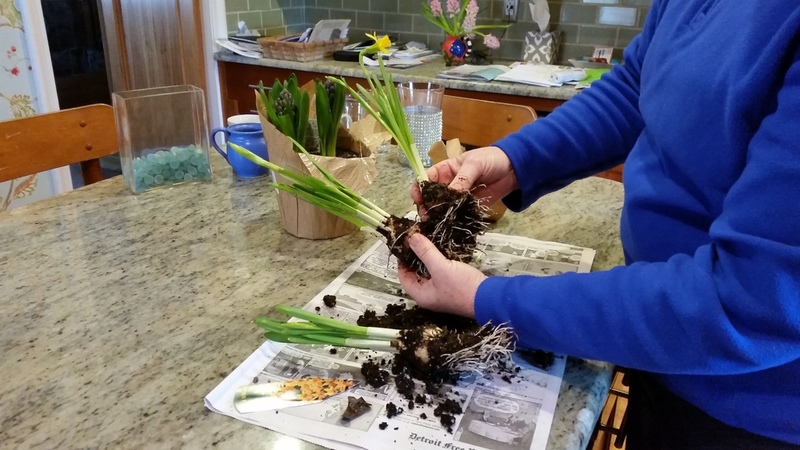 Forcing spring bulbs indoor in the depths of winter is a great pick me up when the temperatures are so cold. But, if you didn’t plan ahead and buy your bulbs when they were available (early fall, September and October), you have the option to pick up blooming forced bulbs at many garden centers and grocery stores right now. Those forced bulbs will come in plain plastic pots which can be dropped into many larger containers. However, you can also have some fun by taking them out of the pot and putting them into some of your own smaller containers. If you want to spread those purchased blooming bulbs around the house, I have a great suggestion! Gather some pretty smaller containers from your collectibles. Vases, pots, cups, bowls, and any small pretty container you love. Spread a couple sheets of newspaper out to collect the soil from the potted bulbs as you carefully remove them from their pot. If there are several bulbs in the same pot, carefully disengage each bulbs’ roots from their friends and rinse carefully under gently running water, working as much soil as possible from the roots and bulb. Once the bulbs are cleaned, place them into your little containers, holding them up from the bottom about one inch as you pour in a base of small coarse pebbles, glass beads or marbles. Add water just to the base of the bulb and VOILA! You have pretty blooming bulbs to place around your home! Who's Peeking Out In The Garden?